Three years ago, online restaurant search and discovery service, Zomato disrupted the startup and advertising space. Zomato decided to roll out a TVC and instead of going to a well-known agency, it went knocking on the doors of fans. It launched a crowdsourcing contest which promised to award two lucky winners Rs. 5 lakh cash prizes each. Zomato received more than 90 submissions for the TVC out of which 7 were shortlisted and shared on YouTube. The ad ‘Koi aakhri khwaaish’ created by a team from Chennai was the winner of the TVC contest. Three years later, the $900 million global company has changed gears. From crowdsourcing its first TVC, the company has rolled out its first TVC showcasing its latest business vertical online food order. Earlier this year in the first quarter, Zomato had disclosed that it will soon start taking orders for food delivery from its customers. A natural progression of his existing business model of food discovery, Zomato decided to pilot the service with 2000 partners in India. It was then told that the service will also be extended to the many foreign markets where Zomato has acquired its competitors. To boost its latest offering of food delivery, it raised $60 million of fresh round of funding in the month of September led by Singapore-based Temasek with participation from existing investor Vy Capital. Prior to the funding Zomato made strategic investments in Gurgaon-based Pickingo and Mumbai-based Grab, both hyperlocal delivery players, to enable last-mile delivery for restaurants, including dine-in-only restaurants that don’t otherwise deliver. However, it’s not just Zomato but this year Indian startup space has been all about food tech. Since last year, 31 food-tech startups have raised seed or angel funding; according to startup data tracker Tracxn, the industry is already being touted to be a $50 billion market, growing at 16% YOY. Looking back the way Zomato has grown and the culture the company breathes, it is a no-brainer that it wants to carve its name as one of the top players in food delivery space. With operations and tech sorted out you are now left with the job of fueling your marketing initiatives. And in India if you want to go to the masses nothing beats the idiot box; thus came about the conscious choice to roll out a TVC. “When we started thinking about our next ad film a few months ago, we knew one thing for sure – we wanted it to be about the people that use us, and what brings them together,” Pramod Rao, SVP Growth said. Coincidentally, the concept got more ground when the company came across a fan tweet that regarded the food ordering app as a new hero of family dinners. We have now twice ordered fab but cheap food by finding nearby restaurants through the #Zomato app. Our family dinners have a new hero. Thereafter the brand decided to rope in one of the best ad agencies in the country, Ogilvy & Mather. In fact this is the first time Zomato is engaging with an agency. On being asked the reason why Zomato went for an ad agency and not a crowdsourcing campaign, here is what Pramod had to state. The first TVC has been rolled out on YouTube. The 46-second video tells the story of a father who is excited to cook for his daughter. But pretty soon we are told that the separated father has overcooked the pasta, with no options left he asks what should be done now. Daughter shows the Zomato food ordering app and before the father could understand, the delivery boy was at the door with food packed in Zomato bags. The father-daughter enjoy the lunch and the video ends with a voiceover asking viewers to download the app for ordering food online. The video has been shared on social media and Facebook has already fetched 23K views. The second TVC will be launched soon and the videos will go on air by mid-November. My bet is that the videos will hit somewhere around Diwali. Festivals are about relatives and good food, why would Zomato want to miss out on the opportunity! 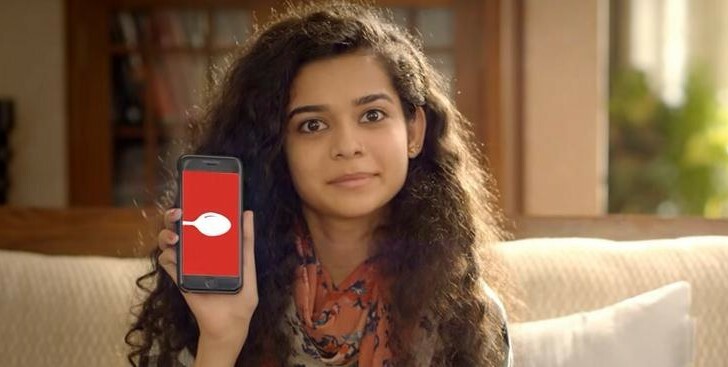 Going by Zomato’s objective, the campaign idea was to deliver a story that would bring families closer to the app. In this first TVC, the ad agency has played to its strength by weaving a separated father and his love for his daughter. One may debate that all fathers are not bad cooks but the food ordering app comes as a life savor when there are no choices. However, the ordering and the delivery happening at lightning speed is over the top. Therein also lies the dilemma of creating 45 second TVCs. In July, competitor Foodpanda launched an aggressive campaign taglined ‘Don’t Call, Just Install’ to appeal to all foodies and grow its mobile app installs. The 30 second TVC chose a funny route to showcase the benefit of ordering food while showcasing a real like problem when you order food via phone. When it’s Zomato you expect something path breaking, funny and real life smart storytelling that matches today’s times. Gone are those days of stereotypical emotional storytelling, even the TV audience has got bored now. The first TVC also showcases the age old belief that men have messed up flats and cooking isn’t their forte. Zomato might argue that there are two kinds of people: those who cook and others who order. Nonetheless the execution is convincing; the brand makes its presence felt but the story could have avoided cliches and scored with all kinds of audiences.